You can gain a considerable advantage over your enemies thanks to the bonuses provided by the Shaman's equipment. They improve the economic characteristics of your Town and the military performance of your troops. 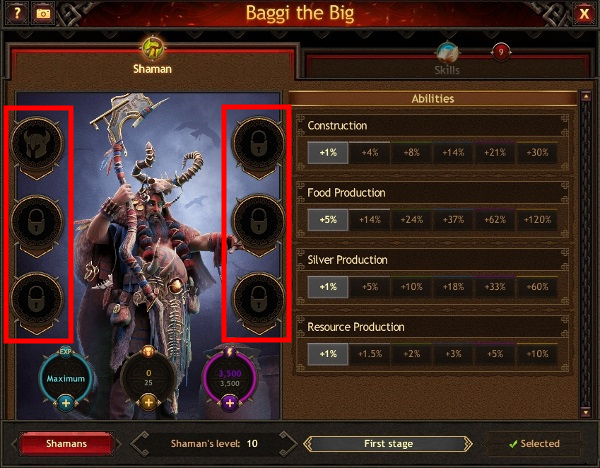 The slots for a specified Shaman's equipment are unlocked as their Skills are upgraded. Inlaying the Shamans' equipment with gems and runes in the Workshop grants additional bonuses. Note that you will need various items of Hero's equipment to craft Shaman's equipment. You can dismantle any Shaman's equipment and acquire one of the equipment pieces that were used to craft it. This piece of equipment will be of the same type as the dismantled one. 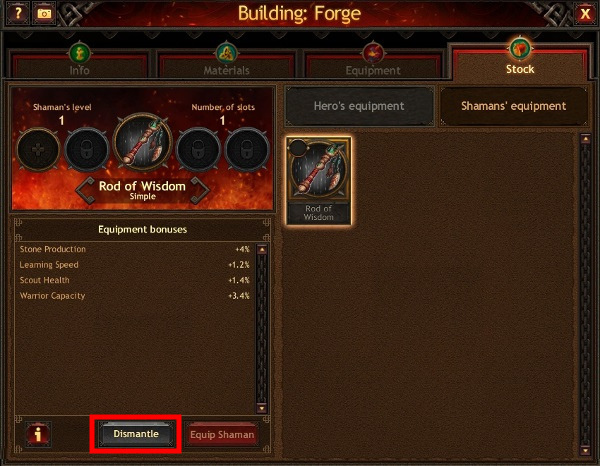 Go to the Forge, then to the Stock tab, then to the "Shamans' equipment" section. Select the piece of equipment that you wish to dismantle, then click the "Dismantle" button. Click the icon of the active Shaman on the Town map, then click the corresponding slot. Select the equipment you wish to dismantle and click the "Dismantle" button.